Brief: Skullcandy’s flagship offering, developed in collaboration with American DJ Mix Master Mike. Build Quality (8/10): The design of the Mix Masters is flashy, but functional. 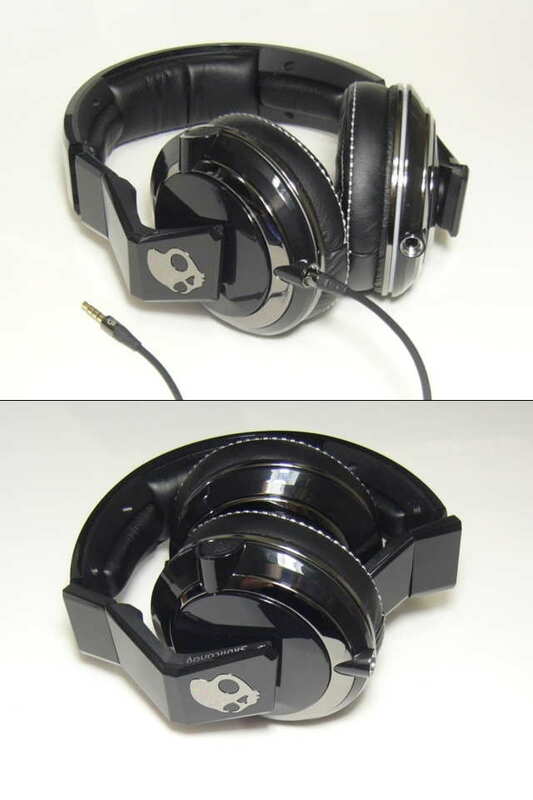 Skullcandy / MMM logos are overabundant and glossy plastics are used throughout, making the Mix Masters a fingerprint magnet, but the hinge and headband design allow them to look rather sleek on the head compared to most DJ sets. They don’t have the solid feel or wear-resistant finish of most Pro-oriented headphones but the competition doesn’t carry Skullcandy’s lifetime warranty, either. In addition to a carrying case, cleaning cloth, and 1/4″ adapter, the Mix Master comes with two cables – one for studio applications and one for use on the go. The heavy-duty studio cable is coiled and features threading on the headphone end for secure attachment. The portable cable is straight, ~4.5’ in length, and features an iPhone-compatible 3-button mic/remote unit. Other features include a dual-state mute button – a feature I’ve previously only seen on Noise Cancelling headphones – as well as a unique feature dubbed ‘Cue Control’, which automatically mixes stereo into mono when one of the earcups is rotated for single-ear monitoring. Comfort (7.5/10): Perhaps the most striking design feature of the Mix Masters is the padding – the earcup pads are extremely soft and the smooth black imitation leather is offset nicely by white stitching. Headband padding is generous as well and the headphones are designed for a snug fit. Clamping force is slightly above average but the cups articulate in all directions to accommodate different head shapes and sizes. Unfortunately the pads are a little too soft for the depth of the earcups – my ears press against the hard plastic grilles and long-term comfort isn’t what it could be. Using a bit of cotton to bolster the pads from below helped, making the Mix Master comfortable for hours. Isolation (7/10): When it comes to isolation the Mix Master behaves more like a semi-open headphone, blocking out less noise than most DJ-oriented circumaurals. It doesn’t leak too badly and should isolate well enough for use while commuting but definitely won’t work on a plane or subway. Sound (8/10): The only Skullcandy products I’ve previously owned were their sub-$100 in-ears, and the Mix Master – happily – doesn’t sound like any of them. It is a forward headphone with hard-hitting bass and prominent mids. In a word, the sound of the Mix Masters is aggressive. The bass is solid, with good depth and decent definition. Punch is plentiful – the Mix Masters hit harder than the Sennheiser HD25s and V-Moda M-80s. The low end certainly is intense but could stand to be a little quicker – the resolution isn’t nearly as poor as with the Beats by Dre Studios but it loses out to the other higher-tier DJ cans in my collection. Still, the Mix Master sounds neither boomy nor muddy while delivering more than enough impact for any application. The midrange of the Mix Masters is also forward and comes across emphasized nearly as much as the low end. The balance keeps the tone neutral, preventing significant bass bleed and suppressing almost all of the warmth one would expect with such heavy bass. The detail level is surprisingly good, accentuated by the forward positioning of the midrange and the somewhat compressed dynamics of the headphone. Both detail and clarity are superior to the best mid-tier sets such as the Beyerdynamic DT235 but don’t quite keep up with higher-end sets like the Sennheiser HD25-1 and Ultrasone HFI-780. The lower treble of the Mix Masters is prominent enough but the response rolls off gently at the top. Overall balance is actually rather good and the tone is close to neutral. The Mix Master doesn’t exaggerate sibilance but the notes are a little hard-edged and lack the refinement of higher-end sets like the Ultrasone PRO 750. The resolution is better than that of consumer-oriented headphones such as the Phiaton MS400 but not quite up there with the Ultrasones or the Sennheiser HD25, either. The Mix Master was clearly designed to work well with modern recordings – a purpose that suits it very well. Because the sound of the Mix Master is so forward and aggressive, the soundstage appears below average in size and lacking in depth. The Mix Master is resolving enough not to sound congested but all of the spatial cues are delivered upfront. The poor depth is reminiscent of the Phiaton MS300 and Sennheiser HD25 but even the HD25 – which is not exactly known for soundstaging prowess – is on the whole less forward than the Mix Master. Part of the problem are the mediocre dynamics of the Skullcandies – great for pushing detail into the foreground but not so good for realistic imaging. That said, coupled with the extreme efficiency of the Mix Master, the presentation and compressed dynamics actually compensate for the average isolation of the headphone and allow them to work better in noisy environments. Value (7/10): There is no getting around the fact that Skullcandy’s Mix Master is a pricy proposition – at $300 it is dearer than many popular DJ and studio-oriented offerings from established Pro Audio brands, but then it is one of the most feature-rich products out there. Built-in mute functions, Cue Control, and ambidextrous cable input are all excellent additions for DJ use, and then there is Skullcandy’s lifetime replacement warranty – something no competitor can match. The Mix Master also has the makings of a great mainstream headphone, producing plenty of quality bass and meshing well with modern recordings. It is one of the most efficient full-size headphones I’ve tried, reaching dangerous output levels easily with a portable player, and compensates for its average noise isolation with aggressive sound delivery. In terms of absolute audio quality, it doesn’t quite stack up to expectations set by the price – the overall balance is quite good and the bass impact, clarity, and detail levels don’t disappoint but soundstaging is a weakness, hindered in large part by mediocre dynamics. Still, the Mix Master is the first celebrity-endorsed headphone I can listen to all day and is easy to recommend for professionals interested in its unique feature set and consumers with pro audio aspirations.